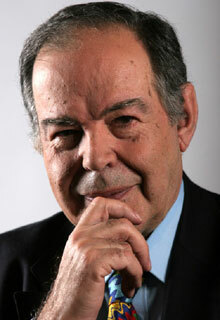 Edward de Bono is a physician, author, inventor, and consultant. He originated the term lateral thinking, and is a proponent of the deliberate teaching of thinking as a subject in schools. Edward Charles Francis Publius de Bono was born to an aristocratic Maltese family. His father was a physician who was awarded a CBE and his mother an intellectual and journalist. He studied at St Edward's College in Malta. Nicknamed 'genius', he graduated at the age of 15. De Bono then gained a medical degree from the University of Malta. He was a Rhodes Scholar at Christ Church, Oxford where he gained an M.A. degree in psychology and physiology whilst being a keen sportsman. De Bono was the President of the Scottish Reel Club at Christchurch, Oxford. He also has a Ph.D. degree and a D.Phil. degree in Medicine from Trinity College, Cambridge, a D.Des. degree (Doctor of Design) from the Royal Melbourne Institute of Technology, and an LL.D. degree from the University of Dundee. De Bono is a member of the Medical Research Society and the exclusive Athenaeum Club. He has held faculty appointments at the universities of Oxford, Cambridge, London and Harvard. He is a professor at Malta, Pretoria, Central England, and Dublin City University. de Bono holds the Da Vinci Professor of Thinking chair at University of Advancing Technology in Phoenix, USA. He was one of the 27 Ambassadors for the European Year of Creativity and Innovation 2009. He was nominated for the Nobel Prize for Economics in 2005. You can analyse the past, but you have to design the future.